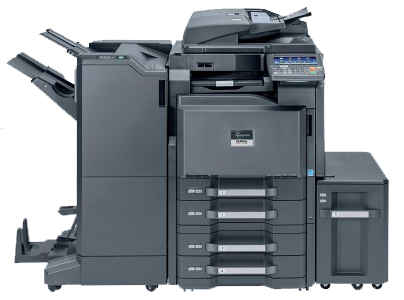 Ricoh 6501 Photocopier rental in Karachi has Incredible productivity guaranteed with speed of 60 paper per minute in color, 65 paper per minute in black and white. In addition, newly designed image developing system offers professional color quality and consistency over long runs. Moreover, Save money on outsourced printing with a complete range of inline finishing capabilities. Furthermore, Stapling, punching, cover insertion, booklet making, multi-folding and ring-binding options. Ricoh MPC 6501 is available on rent speeds with benchmark output quality and superb media flexibility. You can save time and costs by keeping your color document production in-house. The MPC 6501 are economically viable color solutions for offices. Color has impact; it emphasises your message and adds a professional look to your documents. Presentations, mailings,newsletters and spreadsheets all become more recognisable, attractive and readable. Moreover, you can put a color logo on your documents, brand recognition will improve among your clients and partners. Save time, costs and empower your office with a truly digital information flow. Easily share scanned documents by sending them instantly to any email address in the world. Moreover, Scanned documents can also be distributed directly to a dedicated network folder, or made accessible through a web browser. In addition, you can store, retrieve and re-use documents any time using the systems’ built-in document server. Local scanning to USB/SD card is available as an option. The new toner takes image quality to new heights. It’s minute, yet uniform particle size allows for precise reproduction of even the finest lines without sacrificing perfect color density. As quality is consistent even during longer runs with the newly designed image developing system. As a result, there is no need to outsource color documents.